You can't stop Adrianne Palicki from starring as a badass superheroine, people. The former Wonder Woman has just joined Agents of SHIELD's second season as Bobbi Morse, a.k.a the top agent codenamed Mockingbird. Now that's some damn fine casting. Palicki has experience as a kickass member of a secret global peacekeeping organization (GI Joe: Retaliation) and in superhero tights (David E. Kelley's Wonder Woman pilot, in which she was literally the only good thing). 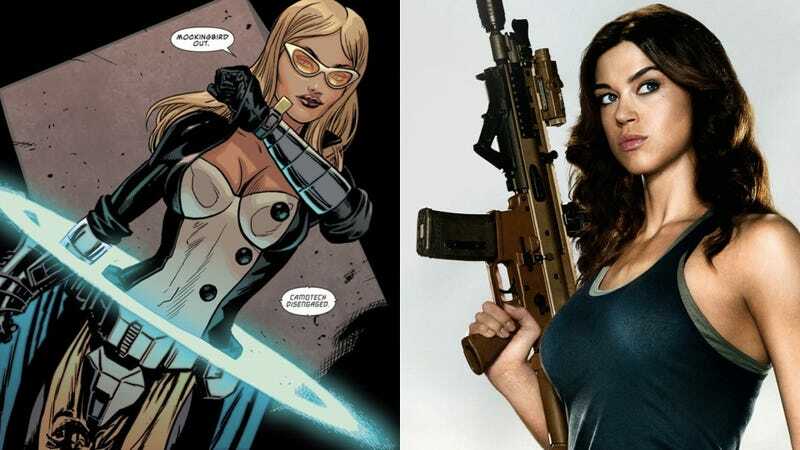 If Marvel chooses to bring Mockingbird to the movies, Palicki will easily be able to hold her own against her frequent comics love interest Hawkeye or even moonlight with the Avengers, as she was a core member of the West Coast team in the '80s. Right now, she's only been hired to star in the fifth episode of Agents of SHIELD season 2, although she could easily return for more — although The Hollywood Reporter cryptically says she might not be an ally to Agent Coulson and his team. Boo. I say ABC just orders a Mockingbird show right now, and then runs Agents of SHIELD, Agent Carter and Mockingbird all on Tuesday night as a three-hour block called Marvel's Evening of Badass Women. Who's with me?